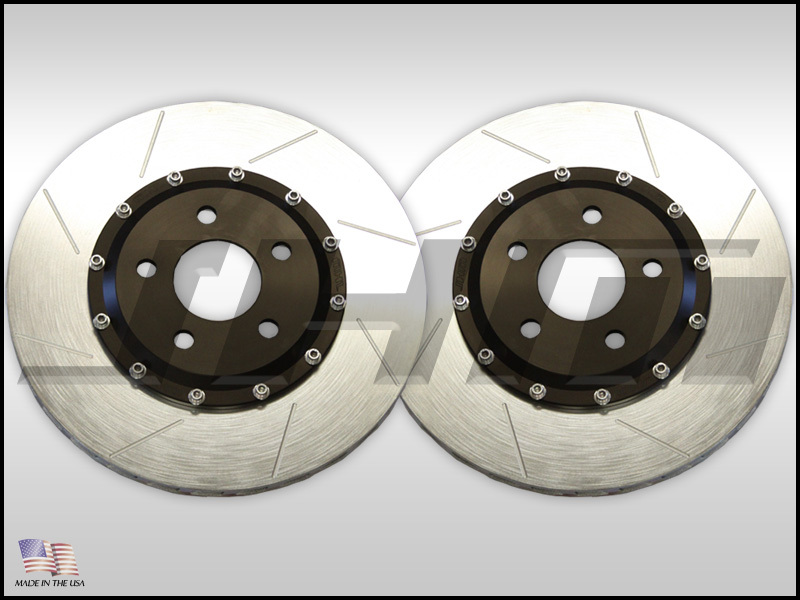 NOW AVAILABLE WITH BLACK CALIPERS!!! Select your choice from the dropdown below. Due to popular demand, all of our 2-piece, lightweight rotors will now come with black anodized rotor hats featuring Type 3, hard anodizing, the highest quality and hardest anodizing available for aluminum. This will make the rotor hats more resistant to fade and wear and will hide brake dust better. Due to popular, demand all lightweight rotor rings will also feature zinc plating. This high quality coating will slow the effects of corrosion and keep your rotor rings looking good through the winters. In stock and ready to ship as of 8-1-2012. FINALLY a low cost front BBK (Big Brake kit) solution for your C5 Chassis A6 or S6 with the 4.2L that uses the popular Porsche Cayenne caliper (6-piston Brembo) while clearing OEM 18" wheels and most aftermarket 18" wheels as well. 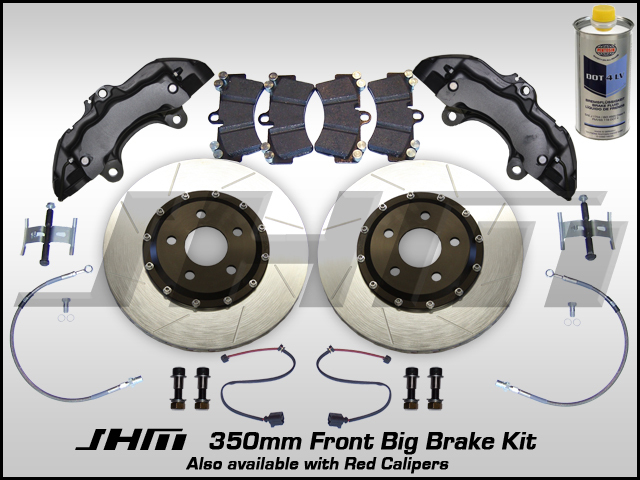 INCLUDES: 2 - JHM 2-piece Lightweight Slotted Front Rotors (350mm x 32mm), 2 - BRAND NEW OEM Porsche Cayenne (6-piston Brembo) Calipers - Available in Silver or Red, select your choice from the dropdown menu below (lines and bleeder screws swapped from end to end by JHM for proper performance on an Audi), 2 - Stainless DOT approved Brake Lines, 1 - Set OEM Pagid Pads or Hawk Performance Pads (select below), 2 - OEM Cayenne Brake Pad sensors (they work by only splicing 2 wires), 1 - Liter Pentosin DOT 4 Synthetic Brake Fluid and all bolts and hardware to mount the calipers with JHM exclusive 16mm to 14mm stainless bushings to snuggly fit the caliper - DOWNLOAD INSTRUCTION ZIP FILE BELOW WITH PICTURES AND NOTES (not sent with kit). Why the Porsche Cayenne caliper? With its 6-piston design and MASSIVE brake pads it is a strong performer. Also, it bolts right up to your spindles with NO brackets. All you need is some bolts, nuts, brake lines, and JHM rotors and you have a 350mm BBK. Being that it is an OEM part they are readily available and can be found used for great prices. We worked closely with a race brake manufacturer that supplies many NASCAR racers and a couple major brake kit companies. Due to their expertise we chose to have them build us the outer rings to our specs to fit the C5-A6s and S6s with the 4.2L with a Cayenne caliper bolted on. 12 attachment points for durability and strength. NOTE: The C5 A6-S6 4.2l V8 spindles sometimes have excess material where the caliper mounts to the spindle at the upper mount point. This takes the caliper out of parallel to the rotor. Check for this by installing the caliper and rotor with no pads and checking that the outer pins are the same distance from the rotor (make sure you have the rotor flat and installed with 5 bolts). If the top pin is much closer or touching you need to shave down the upper mounting point until the caliper is parallel with the rotor. Also you will notice that the caliper is closer to both outer pins vs the outer pins, this is ok and as designed. This outward bias is there to give max clearance for the rotor from the spindle and for optimum performance. Unfortunately this is a mass produced cars and inconsistencies do happen from time to time in the manufacturing of a car. This is a quick fix and once the caliper is parallel the kit will install easily. Note - This brake upgrade only fits under 18" wheels or larger. It fits stock 18" C5-A6 4.2L wheels with NO wheel spacer and most other OEM and aftermarket wheels as well. 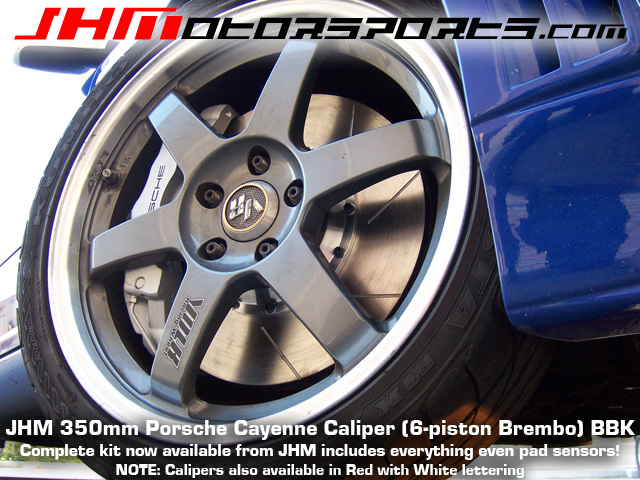 - Caliper Color: Choose from Silver with "Porsche" in Black Lettering, Red with "Porsche" in White Lettering, and Black with no lettering.